Heritage The Villas 4 is entirely designed to ensure that your holiday in Mauritius is as relaxing as possible. With four spacious and air-conditioned bedrooms, this villa is fringed by majestic mountain ranges and vivid greenery that certainly echoes a quintessentially island vibe. Perfectly furnished with spacious living areas, Heritage The Villas 4 is also designed to accommodate eight guests. At Heritage The Villas 4, guests will have their pick of four bedrooms that boast a striking scenery of the surroundings mountains. The master bedroom is beautifully furnished with an en-suite bathroom that comes complete with a tub, shower and dual sinks. A king-sized bed and a safe is also included. All the bedrooms are fitted with air-conditioning units, providing some much-needed respite from the island heat. Heritage The Villas 4 has a large tropical garden where you can kick back and relax with a chilled drink as you soak in the warm tropical sun. In the garden, you’ll also find a gloriously large and refreshing swimming pool with cool azure waters to help you recover from the tropical heat. Best of all, barbecue facilities have additionally been set up for you to enjoy fun nights out surrounded by your friends and families. In the garden, guests of the villa can also make the most out of the sun beds to catch some rays and work on their tan. Rest assured that the pool is fully illuminated by night. Airy, spacious and overlooking the garden, the living areas of Heritage The Villas 4 have a homely comfort to them, which will only serve to enhance your relaxing time. In the living room, for example, you’ll see highly comfortable couches and a coffee table where you can put your feet up as you enjoy a movie on your flat-screen television that comes complete with a full entertainment system. Additionally, you’ll find a dining room that can seat up to eight people. Because Heritage The Villas 4 is entirely self-catering, you will be able to make full use of the kitchen which comes equipped with everything you’ll need to make your own meals, such as stovetop oven, microwave, dishwasher, coffee maker as well as various utensils. Because Heritage The Villas is committed to ensuring that you have the vacation of a lifetime, rest assured that you’ll be able to benefit from an extended range of services. For example, a cleaning lady will come by daily to take care of any tedious housekeeping tasks. Additionally, the complex can provide in-house massages, chauffeur, personal butlery and even a personal house chef, should the need for one ever arises. These services come at an extra fee. 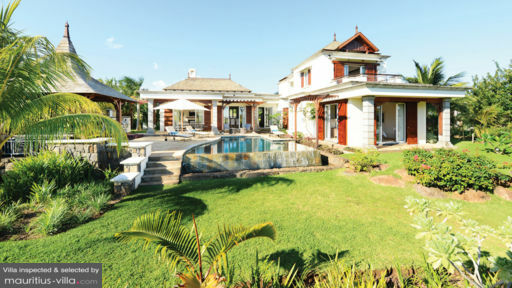 Heritage The Villa 4 is located in Bel Ombre, in the south of Mauritius. Not far from the villa is found the sunny fisherman village of Mahebourg, where you will be able to indulge in as much shopping as you want. If you don’t feel like going out, you will be glad to learn that enjoy the various amenities offered by Hertiage complex, such as Mauritian, Indian, French and Japanese restaurants. Additionally, you can also enjoy an exclusive access to a nearby Golf Course, where you’ll get to work both on your swing and your tan at the same time. Guests of Heritage The Villa 4 can also benefit from access to the C Beach Club as well as Annabella’s and the Club House. Really nice holiday in a 4 bedroom villa. The place was very private. The kitchen was spacious, enough cultery to cater for dinner for 15 people. The staff were very caring and attended to all our requests. Food at C beach club was nice but could be better, lacked varieties of pastries, fruits, juices. Could provide few more varieties like asian meal: noodles for breakfast or rice and curry. We enjoyed our stay and will go there again.